I have been wanting to try dyeing from natural materials for a while now and this might be the time to do it. The muted colors from natural dyes echo the colors from the West Desert that I want to replicate. I have some natural reclaimed silk raveled from a thrift store sweater that would be perfect to try some dyeing experiments on. I wound the silk into 1 oz skeins so I can try a variety of dyes. 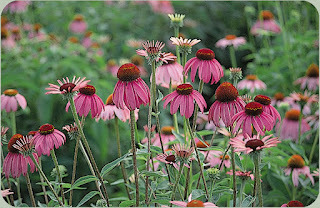 I think the first experiment will be with some purple coneflowers in my garden. I think they will yield a yellow but I really don’t know. The mordant I am planning on using is just alum and cream of tartar. I don’t want anything more toxic than that in my house because I have two small boys that get into everything.